Set screw type shaft collars have been used since the early days of manufacturing mills dating back to the 1900's over the years improvement has been made to the design making them more suitable for health and safety reasons. Tasman stock a huge range of Metric and Imperial sizes available in carbon steel or stainless steel where rust resistance is required. Zinc plated shaft collars are also very popular and can be supplied from our stock's or for unpopular sizes just a few days from order to despatch. On many occasion, we have been asked to supply the shaft collars with a key-way (please see below for more information) suitable for a mating shaft key which can be purchased from our stock inventory Feather Keys, each shaft collar comes complete with a set screw to secure the shaft collar onto its shaft. Here is a bit of useful information regarding the History of shaft collars. Clamp Type Shaft collars are designed to make fitting or adjustments quick and easy to help reduce downtime. With just the need of a hexagon drive, quick installation and adjustments can be done to Clamp Type Shaft Collars. 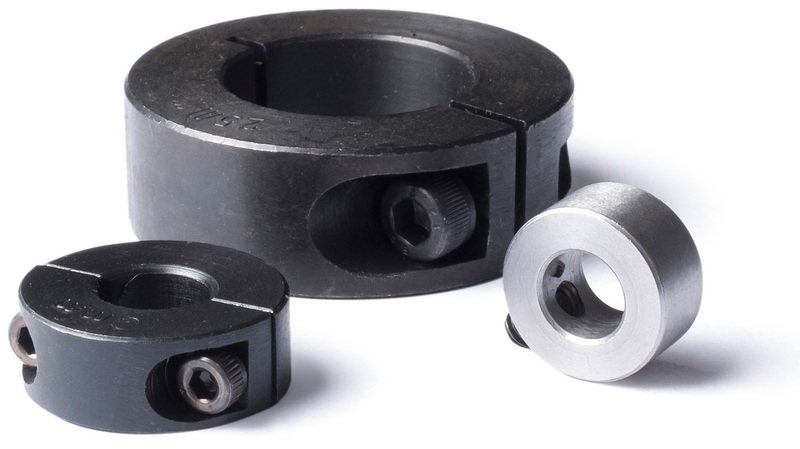 Clamp Type Shaft Collars are used in many applications where access is restricted they are very useful where frequent changes are required or setup adjustments needed. Clamp Type Shaft Collars can be installed by simply sliding the collar onto the shaft and then using a hexagon drive then tightened by hand. To remove or reposition the Clamp Type Collar loosen the Cap Screws and move to its new location this allows for quick and easy change outs. Our Clamp-style shaft collars designs solve the problems associated with the set-screw collar. We have one-piece and two-piece designs. The screws are used to compress the collar and lock it into place and keep the screws from protruding into the shaft. They have a design that makes it easier to maintain and helps to avoid any shaft damage by compressing the collar its self. The force from the tightening is distributed uniformly around the shaft, giving an increase of nearly twice the holding power of set-screw collars. These collars have an added element of a key slot. This could be used to help in applications where the load is increased and stability is needing to be increased so the collar doesn't slip. If it's imperial sizes you're looking for like 1 " shaft collar, 2 " shaft collar, 3 " shaft collar or any other size like 5/8 " shaft collars we can help. If it's in metric we have those as well. If it's 25mm steel collars or 12mm shaft collars or anything like this just choose from the selectors and filter them as needed. Not only do we have so many types and sizes but there's the material they are made of as well like a stainless steel shaft collar or steel black oxide collars. If you weren't able to find the size or type of collar you were looking for with the product filters or would like an account with us just give us a call.